Learning is an endless process. Once we complete the prescribed norms of academic standards, it must not be considered as an accomplishment. It’s a beginning in fact. Since the time immemorial, lust to succeed prevailed. Questioning the abilities of other’s and scrutinize them at every step is the nature of human being, which lead the mass towards destruction and produced nothing good. Everything that exists in this world is useful and credibility of same can not be downgraded at any cost. All the sciences are equally important and jeopardy must not be created against it. Ayurveda brings solace. It is a multi utility science. It just not confines itself explaining diseases and their treatments but goes beyond the level of academic interests and instills moral values in the life of an individual. It’s a tool which should be learnt by everyone to lead a healthy life. In fact the greatest aim of this science “ swasthasya swastha rakshanam – to maintain the health of a healthy being” , can be achieved only if we start teaching Ayurveda to our coming generations right from the beginning itself. Because, the word Ayurveda it self means – knowledge of the life; and that is what we want to share with our children, isn’t it? 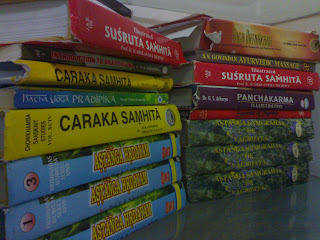 Ayurveda is a data based knowledge. It’s a heritage, and sum total of experiences of our ancestors. It’s an out come of all the pain that they underwent during the process of development, it’s a message to the coming generations that they wanted to convey - we suffered and we want that you must not, so we are intent to carve it down on the pages of history for your ease. Unfortunately it did not reach to the mass or thanks to our we don’t want to learn approach. Dina Charya – regimens to be followed on daily basis. Ratri charya – regimens to be followed on night basis. Ritu Charya – regimens to be followed on seasonal basis. Actually if we observe scientifically, physical health can be maintained by above measures. But another leaf has been added in order to help people to be in the best state of their health, and that is “Sadavritta – code of conduct”. It’s all about reinstating the moral values which are an important tool for over all development of life. Its way to represent ourselves in to the society. It’s a yardstick to measure our behavior. If one follows the advices given in the ancient texts, we can sure see the change. We can create a flawless society. We must change ourselves, and we must not bank upon some good deeds of past, but every day there must be a good deed indeed. Everyone should learn Ayurveda, not to become a doctor; but to be a human being. It connects you to yourself; it reminds you not to be cynical but to be a part of the success story. Ayurveda is way ahead of diseases, their diagnosis and treatment. In fact it stresses to be fit. It’s a refined approach towards the life.